Ah, the Evil that started it all. Few games have had such a seminal impact on a genre as Resident Evil. These are gaming’s defining moments, the yardsticks by which future releases are compared. In the case, it’s pretty well the source of the zombies that are every-darn-where in games just now. You can hardly turn around for rotting shamblers chewing on your undercrackers, and it’s all thanks to this 1996 classic. But hey, let’s not hold that against it. Resident Evil hit the PlayStation eighteen years ago. You’re presumably familiar with the sorry tale of Jill Valetine and Chris Redfield, but here’s a quick recap. The elite S.T.A.R.S team has been dispatched to investigate a series of horrific murders in Raccoon City. Contact with the Bravo team is lost in the Arklay Mountains, which prompts a rescue-the-rescuers effort from Alpha squad. And so begins that classic romp through the forest we all know so well. 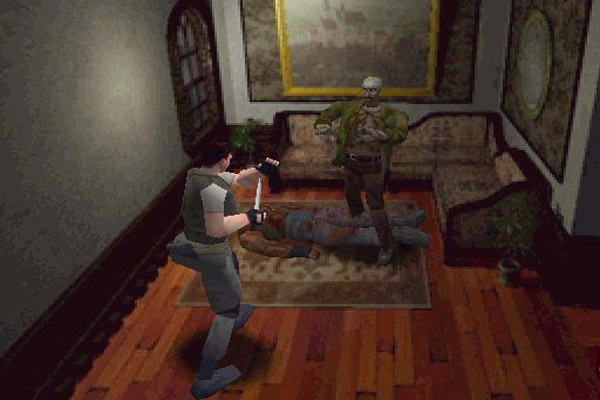 There’ll be a dodgy mansion to cruise through, rabid hellhounds gnawing at delicate fleshy bits and Wesker wearing his sunglasses indoors like a foolish fool. Fans will fondly remember that opening cutscene, and how utterly cheesetastic it was. But somewhere in that big ol’ display of awful, awful acting, survival horror history was being made. Jill, Chris, Barry (with his ever-brilliant ginger beard) and co seek refuge in the Spencer Mansion. Once inside, they discover zombies and all manner of other festering secrets. Betrayal, secret super-villainy, elaborate faked deaths, it’s quite the drama. Under the bed? That’s like SO last century. For today’s discerning monster, in the wardrobe is the fashionable place to lurk. I’m sure I don’t have to go into the gameplay. As either Chris or Jill, you’ll traverse the mansion and piece together its secrets. Through the magic of static camera angles and infamously tanky controls, you explore and take out the fiends that now inhabit the cursed place. It isn’t just combat, either, with a range of different kind of puzzles to tackle; most of which involve some irritating inventory-flailing. While bumbling around, and enduring cryptically crap clues from your fellows, you piece together the mystery. These strange beasts are the results of unholy experiments by the pharmaceutical company, Umbrella Corporation. That darn T-virus (‘Angry Mutants in a Can!’). 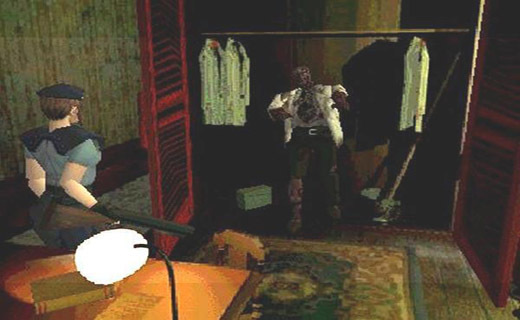 Survival horror as a genre was… severely lacking in 1996. Resident Evil served as the template for ‘doing it right,’ and has brought us almost two decades of bizarre plotlines and fun with zombies since. More recent releases may be more questionable, but that’s a story for another day.